Historian Kimberly Jensen will provide an illustrated overview of women and citizenship in Oregon, giving context for a conversation among the pioneering women public servants and young women who have interviewed them over the summer. Reflecting on their interviews, the panel will engage in conversation about the history and future of women in Oregon politics. They will address questions such as: What constitute “women’s issues” in politics? What is the definition of a “feminist” politician? What defines a citizen? Is that definition different for men and women, and should it be? How are these issues different for women of different ethnic backgrounds? The audience will also be invited to ask questions. 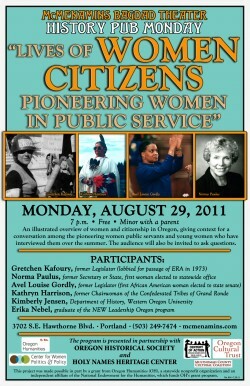 Participants: Kimberly Jensen, Historian; Gretchen Kafoury, former Legislator (lobbied for passage of ERA in 1973); Norma Paulus, former Secretary of State of Oregon (first woman elected to statewide office in Oregon); Avel Louise Gordly, former legislator (first African American elected to state senate); and Kathryn Harrison, former Chairwoman of the Confederated Tribes of Grand Ronde; Graduates of the New Leadership Oregon program. The program is presented in partnership with Century of Action: Oregon Women Vote, 1912-2012, as well as with the Center for Women, Politics and Policy at Portland State University. History Pub is a collaboration between the Oregon Historical Society, Holy Names Heritage Center, and McMenamins. This project was made possible in part by a grant from Oregon Humanities”>Oregon Humanities (OH), a statewide nonprofit organization and an independent affiliate of the National Endowment for the Humanities, which funds OH¹s grant program, and Multnomah County Cultural Coalition (Oregon Cultural Trust).